Earlier this year, the screenwriter of cult classic “Idiocracy,” Etan Cohen, said that he never expected the movie to “become a documentary” while observing the rise of Donald Trump — who’s now, of course, the presumptive Republican presidential nominee. It turns out the people behind the 2006 comedy have now come together to produce an anti-Trump ad campaign leading up to the election. In “Idiocracy,” an “average American” (played by Luke Wilson) wakes up after a government experiment five centuries later to find that society has gotten dumber and the president is a former professional wrestler named Elizondo Mountain Dew Herbert Camacho (played by Terry Crews). Cohen told BuzzFeed in a recent interview that he and “Idiocracy” director Mike Judge (also creator of “Silicon Valley”) began talking after Cohen’s statement via Twitter went viral. 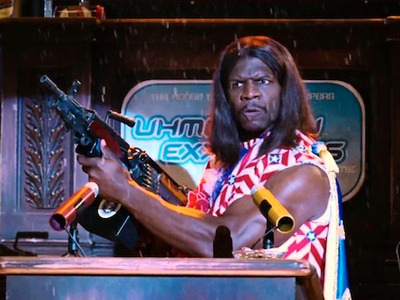 They decided that they should shoot fake political ads satirizing Trump using Terry Crews’ Camacho. Judge and Cohen are currently waiting on Fox to clear the rights for Camacho before shooting the ads.